Altan Dinç is the Group CFO of STFA Holding. Graduated from the Business Administration Department of Middle East Technical University and has an EMBA degree from Sabancı University Business Administration Department. 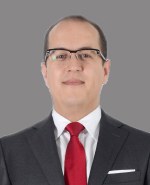 Altan Dinç was appointed as STFA CFO in 2013 after serving as an inspector at Dışbank Inspection Committee from 2002 to 2005 and as Corporate Finance Manager at Avea from 2005 to 2008 and Global Menkul Değerler from 2008 to 2011. He joined STFA Investment Holding A.Ş. in 2011 as a Corporate Finance Director.